Jun 10, 2017 @ 10:00 AM — by Retina Associates, P.A. Diabetes can cause many health complications, especially when the condition is uncontrolled. One common complication is an eye condition called diabetic retinopathy. Diabetic retinopathy can cause mild to severe vision problems, including blindness, if left untreated. At Retina Associates, P.A., our team of physicians offers the most advanced techniques to treat retinal conditions and protect eyesight. If you would like to learn more about diabetic retinopathy treatment and live in or around Kansas City, MO, please contact our offices to schedule a consultation. Diabetic retinopathy is a complication of diabetes that causes damage to the blood vessels that nourish the retinas, the area of the eye that senses light and makes vision possible. Those with either type 1 or type 2 diabetes may develop diabetic retinopathy. Diabetic retinopathy is caused by consistently high blood sugar levels and is most likely to develop in those who don't manage their blood sugar. When there is too much sugar in the blood stream, as seen with uncontrolled diabetes, the sugars begin to block the blood vessels that feed the retina. As blood sugar collects in these blood vessels, it cuts off blood supply to the retinas. 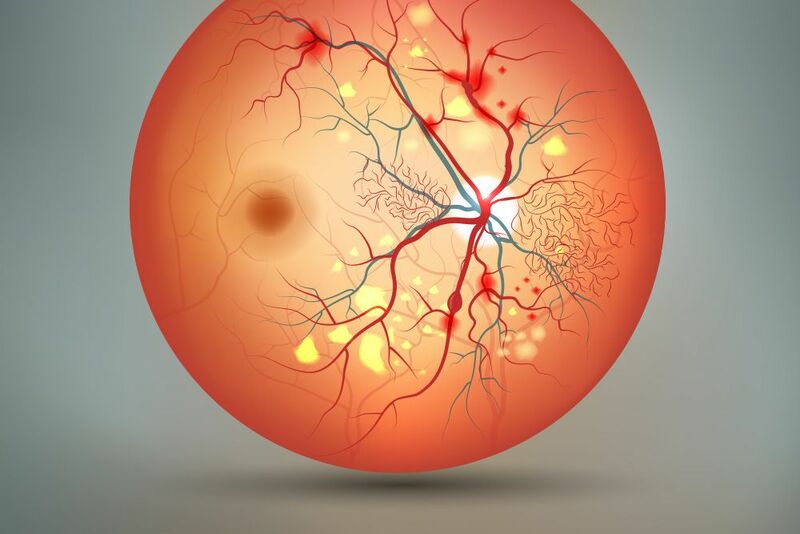 In some cases, diabetic retinopathy causes fluids to leak and nerve fibers within the retina to swell, also causing vision problems and ultimately leading to blindness. Treatments for diabetic retinopathy vary based on its severity and progression of vision problems. Since there is no cure for diabetic retinopathy, treatment largely aims to slow or stop the progression of the condition. After treatment, it is important to continue to undergo regular eye exams as diabetic retinopathy may continue to progress. For those with mild to moderate diabetic retinopathy, immediate treatment may not be necessary, but greater care should be taken to closely manage blood sugar levels and monitor eyesight. In many cases, proper control of blood sugar levels can slow the progression of diabetic retinopathy. Scatter Laser Treatment: Scatter laser treatment, also called panretinal photocoagulation, may be used to shrink leaking blood vessels using scattered laser burns. Scatter laser treatment may require two or more treatments to complete. Focal Laser Treatment: Focal laser treatment, also called photocoagulation, is similar to scatter laser treatment but instead is performed with a focal laser. During focal laser treatment, laser burns are used to stop or slow the leakage of fluid and blood within the retina and is generally completed in a single treatment. Vitrectomy: The vitrectomy procedure is performed under local or general anesthesia. During the vitrectomy procedure, a small incision is made within the eye to remove blood from the vitreous area and remove scar tissue. It is important for those with diabetes to have yearly eye exams because diabetic retinopathy may not begin to cause symptoms until is has severely progressed. To schedule an eye exam or to learn more about treatments for diabetic retinopathy, contact our team of physicians today.